← A ham club at a bacon festival: what’s not to like? I saw a prototype of the FX-4 at the Dayton Hamvention this year. Initial impressions are that it is well-built and easily back-packable. I will see about reviewing the LNR FX-4 after they become available. Many thanks to Chris (K4RCH) for the tip! 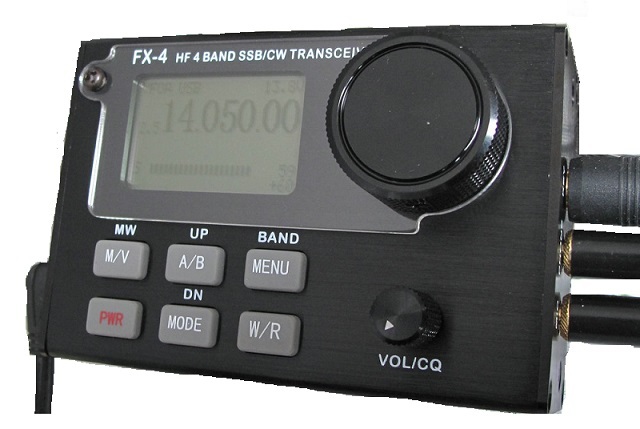 It is has been a few months since we announced the FX-4 Transceiver but it is getting very close to being available for purchase. For those of you that are friends of our Facebook page or visited our booth at Dayton Hamvention got an early peek at it. Here is an updated picture and it will be a very sharp black color. Other pics are on theFacebook page. We have been making some last minute tweaks that we think you will really like. We plan to offer it for purchase under $500 and you can add your name to the wait list which can be found at the bottom of our purchase page. DSP filtering 300KHz, 500KHz. 1.3KHz, 1.6KHz, 1.9KHz, 2.2KHz, and 2.5KHz. This entry was posted in News, Portable, Product Announcements, QRP, QRP Radios and tagged LNR FX-4, LNR FX-4 Transceiver, QRP. Bookmark the permalink. Greetings – the specs for the DSP filtering here don’t look right. Should the 300KHz and 500KHz entries actually be 300Hz and 500Hz ?